I found myself another night in front of my laptop lost in my restless research to find a new golf fashion brand which offers in their portfolio of products style, function and quality combined in a tailored fit polo shirt. But this time I was really successful and I would like to introduce you to Holderness & Bourne, a relatively fresh Golf apparel brand based in NYC and founded by Alex Holderness and John Bourne. While I was looking a little bit around their Homepage I was really attracted by the very clean and classic design of the shirts including this touch of heritage in it. I liked also the colouring and the lovely details of the shirts. Alex and John have been so kind and sent a package over here. After I received the package and opened the nice box I was amazed by the good quality and the cosy choice of the fabric for the shirts. I tried both of them immediately and again I was very impressed because what I liked most was the tailored fit. As we all know golf polo shirts are usually way too big and way too loose. But trust me the shirts of Holderness & Bourne really fit perfect and have a comfortable feeling as well. What was your key motivation to build up this Brand? Alex: John and I founded Holderness & Bourne because we love golf and classic style. We play a lot of golf, and always felt that the market was missing a brand that combined our sense of style and preference for less garish branding with a modern approach to fit and performance. We don’t think that dressing in a classic way has to look stuffy or adhere to outdated vintage styles. We design pieces that are fresh and interesting without being so loud that they are out of place off the links. They are meant to transition easily across settings, whether you’re playing golf or not. What is the main inspiring thought for the Collection? Alex: Our 2016 Collection featured colors and styles inspired by the east coast of the U.S. There are so many great destinations for golf on the eastern seaboard, and our designs drew from their colors and vibes. Look out for some great shades of deep green next year, as we developed another awesome set of colors inspired by the Pacific Ocean and the California coastline. What is your main focus in the Products? What Idea stands behind the Accessories, like the Bags? 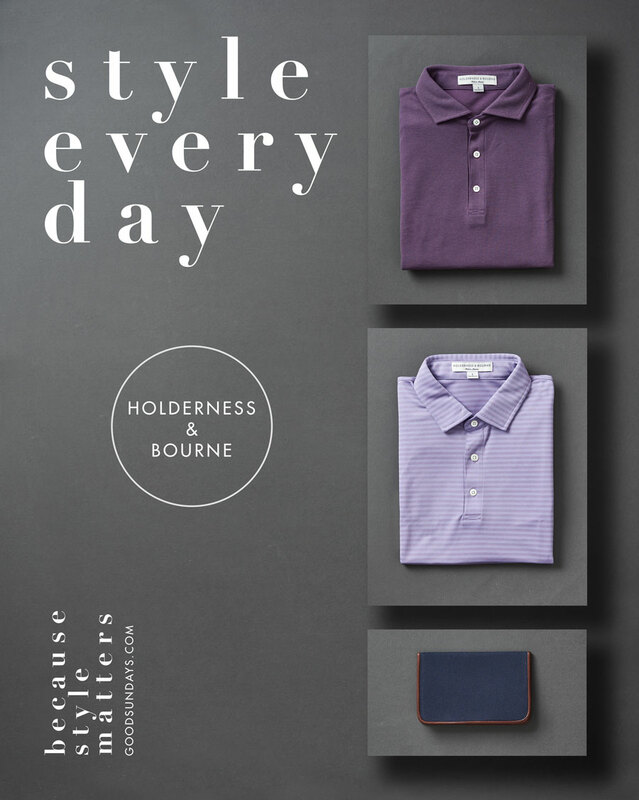 Alex: Holderness & Bourne is a golf lifestyle brand. We are building products for guys who love the game and try to play as much as they can, but they lead busy lives and they need products that look good and perform well regardless of the setting. Most of our customers are professionals who are hoping to sneak in a quick nine or a range session after work. They would rather carry one of our Marston duffel bags to the office and then out to the golf club, as opposed to a cheap plastic gym bag. So we put the same emphasis on style and versatility in our accessories as we do in the apparel. What can we expect about Holderness & Bourne in the Future: Pants? Rain Gear or Jackets? Alex: We are excited about the early success of the brand, which has put us in a great position to expand the collection next year. For 2017 we will have a broader range of polo shirts across both performance poly and cotton styles. The poly styles will feature a technical fabric that we consider to be the best on the market, and the cotton styles will be super soft and comfortable – more for leisure wear but definitely good for golf on milder days. In addition to shirts, we will be introducing more layering pieces – vests, quarter zip sweaters, and other styles – that feature our same combination of classic looks, a more tailored fit, and versatile performance on and off the course. We are just getting started! As everybody know I am a little bit nerdy about golf accessories! So another important point for me to introduce Holderness & Bourne are the lovely styled accessories they offer in their online shop. Different styles and sizes of Bags and Shoe Bags in several colours. 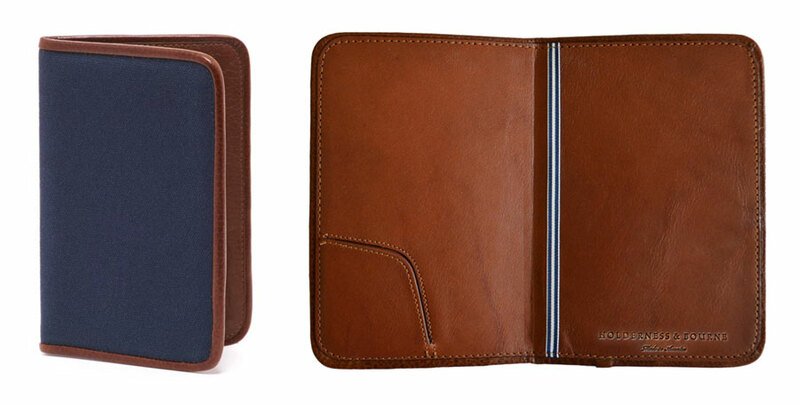 But my all time favorite was the scorecard or passport cover. Hold it in your Hand and you know what I’m talking about.